The information systems field’s focus on theory is well established, and the IS Theory Wiki serves the need for quick review and understanding. The popularity of theories on the site may serve as an early indicator of the future prevalence of these theories, or at least the share of researcher attention during day-to-day research activities. While some theories, such as 2014’s most popular theory—Institutional Theory—likely benefits from visitors from other disciplines, some of the changes may reflect a move away from the individual level of analysis in IS. In fact, none of the top five theories are at the individual level, although 2014’s strongest climber—Social Network Theory—certainly incorporates the individual perspective. Only two pure-play individual level theories breached the top 10—the Technology Acceptance Model and Diffusion of Innovations theory, and whereas the former maintained its 2013 spot, the latter lost several spots. As expected, the same handful of theories played around the top between the two years. 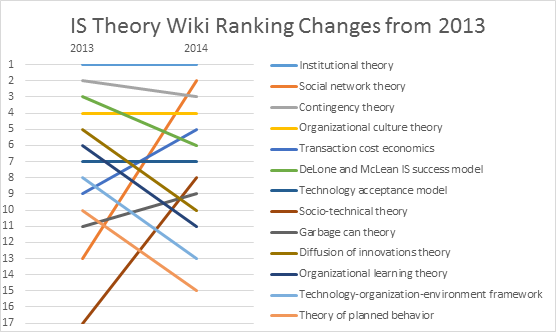 For example, we note that institutional theory was the top visited theory for both 2014 and 2013, and contingency theory, organizational culture theory, diffusions of innovations theory, the DeLone and McLean IS success model, and the diffusions of innovations theory all were within the top 10 both time periods. Social network theory experienced a significant jump from 14th to 2nd, and socio-technical theory jumped almost the same interval, going from 17th to 8th. Transaction cost economics and garbage can theory also felt modest boosts of 5 and 2 respectively. Six out of the 2013 top ten dropped a few intervals in 2014 (contingency theory, DeLone and McLean IS success model, diffusion of innovations theory, organizational learning theory, technology-organization-environment framework, and the theory of planned behavior). The IS Theories Wiki is a resource for the whole field and requires constant updates to stay relevant. We are therefore looking for volunteers to update references and add new theories. Please contact Dave for details.